Volkswagen Jetta is a compact sedan with a rich interior, standard ABS and good safety ratings. It's the only small sedan on the North American used car market that is available with a diesel engine. The Jetta comes as a four-door sedan or five-door wagon. The interior is comfortable and functional. Front seats are supportive. Most of the interior materials are of good quality, however, some of the plastic panels scratch or break easily. Reliability is not up to par with Japanese brands; expect visiting your mechanic often. Some electrical and engine problems are not uncommon, read below. On the plus side, superior corrosion resistance means that the Jetta can better withstand humidity and use of road salt in the winter than some Japanese brands. The Jetta's handling is very competitive too. Fuel Economy: The EPA rates the 2.0L Jetta with an automatic transmission at 20/27 mpg or 11.8/8.7 liters per hundred kilometers on regular gasoline. 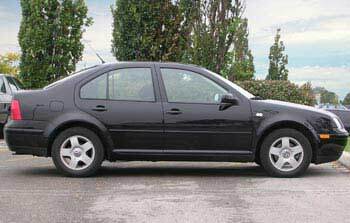 The 2003 Jetta TDI diesel automatic is rated at 29/40 mpg or 8.1/5.9 liters per hundred kilometers. The 2003 Jetta with a manual transmission is even more economical: 35/44 mpg (6.7/5.3 L/100 km). The base 155-hp 2.0L 4-cylinder SOHC is an old-style simple, but not very reliable engine. The high-performance 150-hp (180 hp from 2002) DOHC 4-cylinder 1.8L turbo is certainly a better choice if you like being pushed into the seat. However, this engine is also not trouble-free and needs to be maintained very well to last. The 90-hp 1.9L turbo Diesel could be a good choice for long commuting. This TDI diesel can actually last very long if properly maintained. We have seen quite a few TDI diesels with very high mileage (over 200,000 miles). Models from 2004 came with the more quiet 100-hp 1.9L Pumpe Düse diesel engine. Both diesels have very impressive fuel economy. The most powerful choice is the 174-hp (201 hp from 2002) 2.8L VR6 DOHC. Timing belt or chain? All these engines except the 2.8L VR6 have a timing belt that must be replaced at recommended intervals. Handling and ride: On the road, the Jetta handles very well. Body roll is limited. The ride is "Euro" firm, but not punishing. Safety: Antilock brakes with disc brakes on all four wheels are standard, which was rare in a compact car class. Optional Traction Control and Stability Control systems were also available. In the NHTSA safety tests, only the 1999 Jetta scored poorly in the side impact tests. The 2000-2005 Jetta received five stars for both, the driver and the front passenger protection in the frontal crash tests. 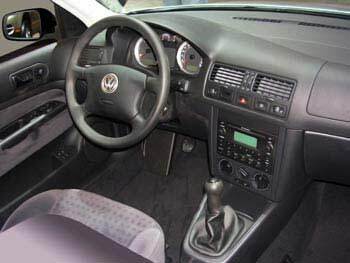 In the side impact tests, the 2000-2005 Jetta received four stars. Reliability and common problems: Reliability is below average. Common problems include oil consumption for the 2.0L engine, water pump failures, faulty air flow sensors, variety of "Check Engine" light, driveability and electrical issues. Pros: Safety ratings for 2000+ models, interior comfort, handling, standard ABS, standard rear disc brakes, corrosion resistance, variety of engine choices. Cons: Below-average reliability, poor side-impact crash test scores for 1999 model, service and parts are expensive, plastic parts break easily, electrical problems. 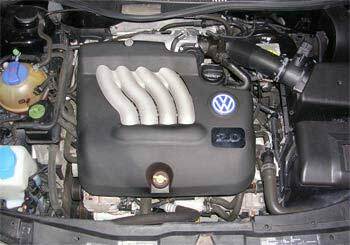 What to look for when buying a used VW Jetta: Check if the timing belt and water pump have been replaced; if not, you may have to have it done, depending on the mileage. The water pump does not last very long, as the plastic impeller part fails often. Test all the electrical accessories. Check all power windows, locks, alarm, heated seats, wipers, remote and even dome lights. Check the oil level; low oil level could be an indication of excessive oil consumption. Check the glove box lid, the cup holder, the ashtray and armrest support, some plastic parts could be broken. Check the radio reception in FM and AM. If the "Check Engine" light is on, have the problem diagnosed before buying a car, as the repair could be quite expensive. Bad front stabilizer bar bushings often cause a thumping noise from the front suspension when driving over bumps. Watch out for coolant leaks; they are not uncommon. Check our illustrated used car checklist. As a last step before buying a car, have it inspected by a trusted mechanic. If you are buying from an independent dealer or a private owner, bring the car to a Volkswagen dealer for an inspection. Maintenance: We recommend servicing your Jetta at a VW-specialized shop; they are tricky to work on. Change engine oil regularly. Check all the fluid levels periodically and top up when needed. When changing the timing belt, it's very good idea to replace the water pump as well. If you have a diesel engine, replace the fuel filter regularly. Have your car inspected, at least once a year, at a repair shop on the lift to keep it safe. If your Check Engine light is on, read what it means here: Check Engine light. Where to check for recalls: Safety Recalls - NHTSA or Transport Canada - Motor Vehicle Safety Recalls. My Volkswagen - official US owner's portal: maintenance videos, "how to" guides and more. This forum at VWvortex.com has many DIY guides and information.